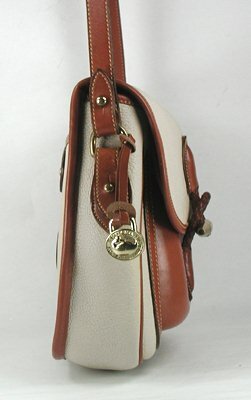 Now here’s a vintage Dooney & Bourke bag that had a cell phone pocket before cell phones were invented ! 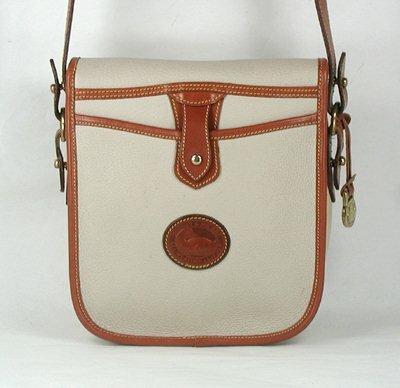 The Outback Collection is noted for its kangaroo pouch on the front and its brass toggle and braided loop closure. Those are signature features. The front pouch is a thick molded leather pocket that doesn’t collapse. The back has a slip pocket with a leather and brass button tab to keep contents secure. It has a unique profile. This Bone and British Tan Medium Outback Bag is R34. 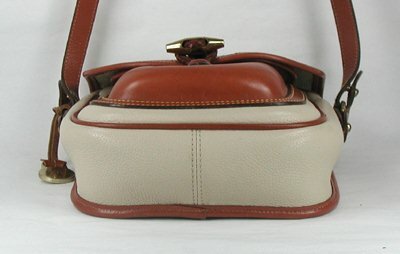 This entry was posted in All Weather Leather, Authenticity, Bone, British Tan, Medium, Outback and tagged all weather leather, authenticity, AWL, bone, British Tan, Dooney, Dooney & Bourke, dooney outback, outback, vintage Dooney by Native American Jewelry Tips. Bookmark the permalink.